Astronomers have concluded that supermassive black holes can grow, from tidal disruption events (TDEs) and perhaps other means, at rates above those corresponding to the Eddington limit has important implications. Such rapid growth may help explain how supermassive black holes were able to reach masses about a billion times higher than the sun when the universe was only about a billion years old. 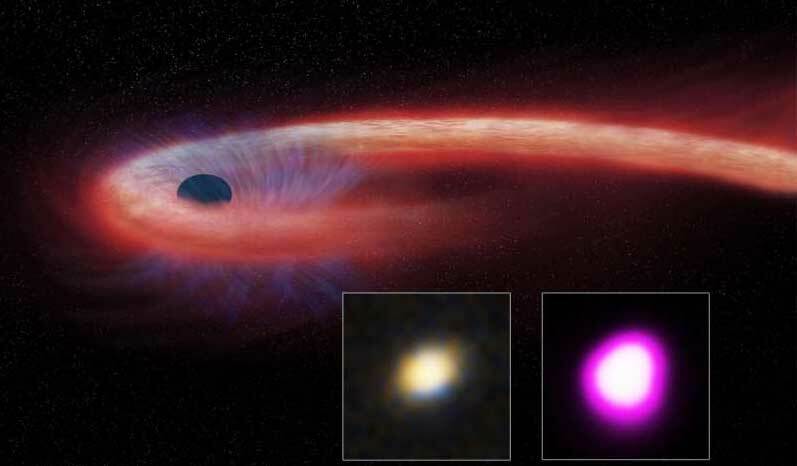 A giant black hole ripped apart a nearby star and then continued to feed off its remains for close to a decade, according to research led by the University of New Hampshire. This black hole meal is more than 10 times longer than any other previous episode of a star's death. "We have witnessed a star's spectacular and prolonged demise," said Dacheng Lin, a research scientist at UNH's Space Science Center and the study's lead author. "Dozens of these so-called tidal disruption events have been detected since the 1990s, but none that remained bright for nearly as long as this one." Using data from a trio of orbiting X-ray telescopes, NASA's Chandra X-ray Observatory and Swift Satellite as well as ESA's XMM-Newton, researchers found evidence of a massive "tidal disruption event" (TDE). Tidal forces, due to the intense gravity from the black hole, can destroy an object – such as a star – that wanders too close. During a TDE, some of the stellar debris is flung outward at high speeds, while the rest falls toward the black hole. As it travels inward, and is ingested by the black hole, the material heats up to millions of degrees and generates a distinct X-ray flare. Based on the modeling by the researchers the black hole's feeding supply should be significantly reduced in the next decade and begin to fade in the next several years. A paper describing these results appears in the February 6th issue of the journal Nature Astronomy.